Bringing a new puppy home is an exciting and joyful time for any household whether it's your first puppy or a companion for your existing furry family members. Since puppies go through a teething process just like human babies do, you want something on hand for them to chew on so they don't chew on your furniture or shoes. This is where the best toys for teething puppy comes in, and we're going to give you a comprehensive buying guide that outlines exactly what you want to watch for in your new puppy's teething toys. 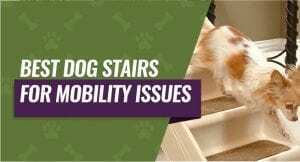 We've also rounded up the top five choices and reviewed them because we want you to be able to compare them and pick the one that is best for your puppy. Two to Three Weeks - Your puppy's first baby teeth start coming in. This will be 12 teeth including the incisors and six teeth on both the bottom and top jaw. Three to Eight Weeks - Your puppy will have around 28 teeth by the end of eight weeks old. This includes the front teeth, incisors, and the first molar teeth. Eight Weeks to Three Months - At this stage, your puppy's baby teeth start to come out in favor of their permanent teeth. This will bring your puppy's tooth count up to 42, and it's also the aggressive chewing stage. Three to Five Months - The permanent incisors stat to replace your puppy's baby teeth at this stage. They'll continue to chew and need teething toys available. Six Months and Older - Your puppy should have all of their adult teeth by this point and have lost all of their baby teeth. You want to mention it to your vet if you notice any baby teeth remaining because they'll have to remove them. The chewing stage should be mostly over at this point. You want your puppy to have healthy teeth well into their adulthood, and having a textured toy combined with good dental hygiene can help prevent plaque and tartar buildup. This can help avoid dental decay as your dog ages, and it can help to prevent complications or infections. Giving your puppy appropriate chew toys can help to prevent them from engaging in destructive chewing. In turn, this can help to save your baseboards, table legs, chair legs, cupboards, and anything else that may be within your puppy's reach. Your puppy's gums can get slightly inflamed as their adult teeth start to come in and poke through their gums. They can get temporary relief by chewing on something and applying pressure to these inflamed areas because it blocks the pain receptors along the surface of the gum line. As your puppy starts to get their adult teeth, your puppy can experience tenderness in their gums. Chewing on durable toys can help to stimulate tooth growth, and it can also encourage the teeth to actually come through your puppy's gums and give them relief as it does so. By relieving the inflammation in their gums, puppies can actually start to toughen up their gums by applying pressure. In turn, this provides a durable foundation for your puppy's permanent teeth to grow in and this allows your puppy's teeth to grow in normally. Teething toys are not all the same, and it's important that you keep several things in mind when you're shopping. This can help you pick out a toy that will survive your puppy's chewing phase with your items intact. No matter which toy you choose, it should be able to withstand periods of aggressive chewing. It's important to make sure that there are no small parts or pieces hanging off of the toy that your puppy can pull off and potentially choke on. You can purchase teething toys that come with a specific flavor and scent coated on and into the toy. 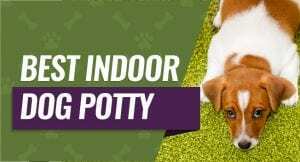 This added benefit can attract your puppy to the toy and keep them coming back to chew on it again and again because it smells and tastes like something they'd like to eat. Just like babies like to chew on cold things when they're teething, puppies can be the same way. 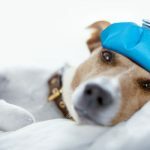 You may want to consider getting a toy that allows you to toss it into the freezer and get it really cold before you give it to your puppy to help with any pain or aching they may have. You want to consider the different types of teething toys available for your puppy including ropes, nylon, rubber, or textured. Nylon and rubber toys are usually very durable, ropes are great for playing with your puppy, and textured toys are excellent for cleaning your puppy's teeth to the gum line. The size of the toy should be proportionate to your puppy's size. This means that your smaller puppy should be able to pick up and carry their toy around without a problem and your larger dog shouldn't be in danger of choking on the toy when they play with it. You may want a toy that grows with your puppy as well. Benebone's wishbone puppy teething chew toy comes in three different flavor choices including bacon, peanut or chicken that allows you to customize it to your dog's tastes. The design features knobs around the ends that help your puppy grip and hold on to the bone as they chew. You'll get to pick from three different sizes including small, medium, and large because this will allow this teething toy to grow as your puppy grows in the first few months. It's made 100-percent in the United States to very strict and consistent quality standards with a durable and bendable material. The ingredients in this teething toy are designed to sink all of the ways through the toy because this can help to hold your dog's attention as they continue to chew on it. 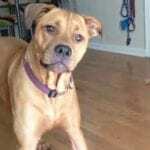 You will have to replace the bone as your dog chews it and wears it down for safety reasons. Puppy parents who bought Benebone's chewing toy were really happy that it features a slightly flexible but durable design with knobs that allow their puppy to grip it. Puppy parents did not like that smaller pieces of the bone can get chewed off for their puppy to swallow. The KONG Goodie Bone comes with a durable design that combines the soothing quality of a durable chew toy with the mental stimulation of a treat holder. The holes on the ends of the bone allow you to stuff treats inside the bone to give you puppy something to work for as they chew it. This teething toy comes in three different sizes ranging from small to medium and large, and the slim design allows your puppy to confidentially carry it around. The bright pink design makes it very easy to find and keep track of this bone when your puppy plays with it both inside and outside. Your puppy will be able to spend hours chewing on this bone without chewing through it because it's made with an extremely durable nylon material. You get a month to return this bone if you aren't completely satisfied with your purchase, and this is plenty of time to see if your puppy likes it or not. Puppy parents were very happy that this bone comes with treat holes in the end because it helps to keep their puppies entertained when they chew on it. The puppy parents did note that this teething toy tended to get very slippery when their puppy chewed on it for an extended period. ONEISALL's teething toy is made with quality nylon that is safe, non-toxic, and durable enough to withstand repeated or aggressive chewing. This toy has several smaller grooves and dips to help clean your dog's teeth up to the gum lines to help keep them healthy and free of plaque. You can pick from a small, medium, or large bone that allows you to quickly and easily pick out the bone that suits your puppy's mouth size. It comes with a bacon flavor paired with a strong bacon scent that can help to attract your puppy to the bone and keep them interested in chewing it. 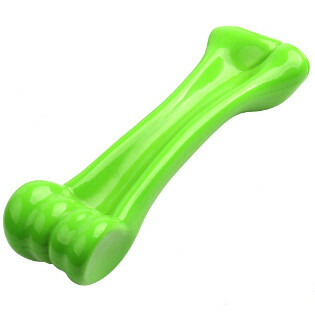 The bright, lime green coloring makes this bone very easy to keep track of and see if you let your puppy chew it outside. The nylon material also gives slightly when your dog chews on it, and it's not rigid enough to cause your puppy problems if they happen to bite it wrong. Puppy parents who purchased this teething toy were very happy that it came with a ridged or grooved design that helped to keep their puppy's teeth clean and healthy. They did note that this bone does come with a very strong smell when they first opened the packaging and gave it to their puppy. 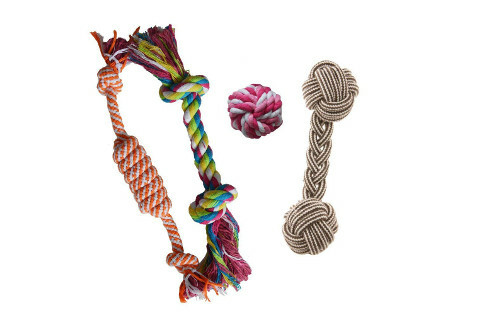 This dental-specific teething toy set features four different bright and colorful rope toys that can keep your puppy entertained for hours at a time. The ropes features knots, braids, ridges, and small balls that allow your puppy to clean their teeth as they chew down to the gum line. The teething toys are made out of 100-percent cotton floss fabric that is safe for your puppy to chew on while being durable enough to withstand even aggressive chewing without tearing. You get the choice of three different toy sets that come with different lengths, knots, and balls. Since this puppy toy is made out of a soft fabric, it is safe to toss them into the washer and dryer for routine cleanings. You do want to take care of any frayed edges or ends that you see because you don't want your puppy to get ahold of them and possibly swallow them. Dog owners who bought this set of teething toys liked that they could pick from a few different sets with a lot of variety. Dog owners were not happy that the edges of these toys tended to fray and come apart if their puppy concentrated on this area. Nylabone's teething chew toy comes in an interesting shape that is actually two different bones twisted into an interactive shape with four ends to keep your puppy entertained. The textured design is great for helping keep your puppy's teeth free of plaque and tarter build up when they chew on it. The toy comes with a beef scent and flavor that can help to attract your puppy and hold their attention. It has a durable nylon construction that is able to withstand aggressive chewing with a bright blue color that is very easy to locate and keep track of as your puppy carries it around. You're also able to freeze this teething toy and give it to your puppy because the cold will help to soothe their gums as their teeth come in. The two-sided design allows your puppy to quickly and easily grip in between their paws as they chew on it as well. Dog parents who bought this teething toy liked that they could quickly toss it into the freezer and give it to their puppy to help soothe any aching gums or teething pay they may have. Dog parents were not happy that this bone only comes in a very small size. Our pick for the best toys for teething puppy is Benebone Real Flavor Wishbone Dog Chew Toy because it comes in three different sizes and flavors that allows you to tailor it to your dog's tastes. We liked that the edges feature ridges that made it easy for the puppies to grip and hold onto the bone. We also chose this teething toy because the material gives slightly when your puppy chews on it, and this helps clean their teeth up to the gum line. Finally, we chose this toy for its durability and ability to withstand aggressive chewing without breaking right away.